Start your journey at the time that suits your schedule. Travel in a private air-conditioned vehicle from either your centrally-located Udaipur hotel, the Udaipur train station, the bus station, or from Ranakpur. 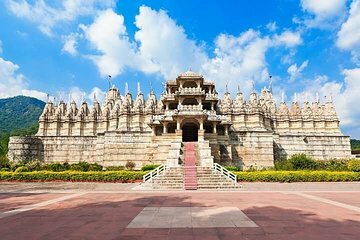 Upon your arrival at the Jain Temple of Ranakpur explore the exquisitely carved marble temple. The extensive building is situated on a wooded hill and contains more than 1,400 marble pillars that support lofty ceilings, domed cupolas, and delicate carvings throughout. Hear about the 15th-century temple's history and benefactors, including the King of Mewar who helped to finance the construction of the temple. After spending time in the Jain Temple, your driver continues to Jodhpur where you are dropped off at your hotel.